Controlling the sequence of events in which process activities are conducted, has been achieved by documented instructions. However, this system is susceptible to 'human error', distractions. Failure to interpret instructions correctly, work load, stress, ignorance of the system, can all lead the operator to make errors, and the consequences can be disastrous. A PETROSAFE SAFETY SYSTEMS (PSS) Interlock guides the operator through a predefined sequence with unique keys for each step. In the event when a mistake is made only then the operator will not be allowed to proceed. Either key will not fit or the valve will be in locked position.Trapped Linear Key Interlocks are simple, mechanical devices, which can be customized to implement a safe sequence of operation in any process activity. PETROSAFE SAFETY SYSTEMS (PSS) has developed process Interlocking Solutions for various applications such as Valve System, PSV, Pig Launching and Receiving, Tanker Loading, Critical work area locking Systems. 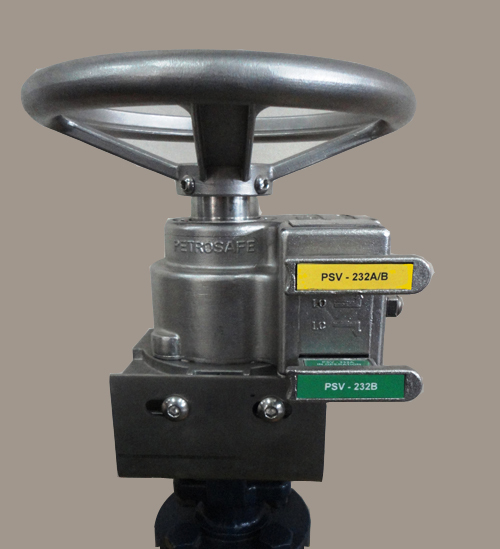 PETROSAFE SAFETY SYSTEMS (PSS) offers simple, reliable and unique Interlocking Solutions with wide range of products like Single Bolt Interlock, Double Bolt Lock, Door Closure Locks and Valve Interlocks, which not only control the opening and closing sequence of process valves but also prevent their unauthorised operation. Interlocks are manufactured from Stainless Steel (SS 316) and hence are maintenance free, tamperproof, robust, reliable, resistant to sand, dirt, snow, ice and moisture ingress.Interlocks are easy to operate and clearly show the condition of the valve and can be fitted to every type and size of valve in service without interfering into the operation of the plant.